Just place a Treegator® Jr. Pro around the base of a tree or shrub, fill it with water, and walk away. It's the easiest way to water your new trees or shrubs! Wrap both sides of bag around a tree or shrub with single or multiple trunks totaling up to 5 inches in diameter. Be sure that the trunk(s) is positioned in the middle of center circular opening. Open red cap on fill valve. Gently lift up on fill handle. Insert hose into fill valve, and turn on water supply. Fill bag to desired level - Maximum bag capacity is approximately 15 gallons. While lifting up on the fill handle, close red fill valve cap tightly, and let the bag drip. Treegator® Jr. Pro will empty in approximately 5 to 8 hours. Failure to follow the handling precautions shown may void product warranty. To ensure proper drainage of water, use on a level surface or properly built mulch pile. Do not use this product in freezing or below freezing temperatures. Use clean water only. If necessary, filter through cotton cloth on hose end. Do not use on tree with trunk diameter/caliper larger than 6 inches. Product contains small parts - Keep away from children. Do not attempt to move bag when full. Product is designed for use on mulch. Using directly on soil can clog drip emitters. Do not use in any manner not consistent with installation instructions. Every Treegator® Jr. Pro is backed by a 3 year limited manufacturer warranty from the original date of purchase, against any defects in materials and/or workmanship. Note: Treegator® brand products are solely designed to assist the user in properly watering a tree. 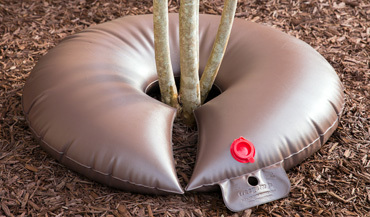 Spectrum Products Inc., the manufacturer of Treegator® brand watering bags recommends that product users follow the installation instructions and precautions provided for each Treegator® brand product. Installation instructions may be found on any provided product tags, packaging materials and at www.Treegator.com. Any other use or misuse of Treegator® brand products for purposes not designed by the manufacturer for its products, is not recommended. Spectrum Products Inc. and its affiliates will not be responsible for any proper, improper, or misuse of Treegator® brand products. • Recommendations are based on a commonly referenced guideline of 10 gallons of water applied per 1 inch of trunk diameter (caliper)*. *Proper watering frequency can vary depending on several factors (tree and soil type, weather, etc.) These recommendations will NOT guarantee that your tree is being watered properly - Use it only as a guide. Consult a local gardening or tree care professional for more information on proper watering practices for your tree type and region.